I'm barely hanging on, dreading that there's still one more day of this dreadful year. The only optimism I have is because I know everything will be better as soon as we hit that magic moment of midnight on January 1. It's a real turning point. The first thing I'll look for in the morning is "2011" on the newspaper. That's what I've traditionally done, but now I usually look on the internet. That's how I know that it's really happened, that we've finally flipped over from misery to bliss. When I was a kid, I got excited about seeing the old man with the scythe and the baby with the top hat. They put it on the front page of the paper back then practically every year. Back then, they dealt in old traditional images like that, the old man and the baby. I was always a little confused about how the baby became an old man in only one year, but in general I understood the symbolism. The old is dead -- good riddance -- the new has come. To me, January 1 is the best day of the New Year. January 3 or 4 I usually think are kind of depressing, because the whole thing for the most part is over. Then when it's Jan. 9 you've lost track, and for all you know it might be the 8th or 10th. It's still the New Year but you're used to it. The only thing that used to mess us up was writing checks, putting the wrong year. But now that we do debit cards all the time, of course we don't even have to think about it. I really can't remember what I was writing about at the beginning of 2010. I'll go look. Just glancing at a couple titles: January - Drive For Pride, when I was into lifestyle coaching. February - Vernon Hoff, Female Impersonator, that was just an anthology of clippings on a guy who left behind no extensive life story, none that I know of. March - I had a short series on collecting dog food labels. There's some real beauties there. April - I started my "Industrial Section" series that went on for 200 parts straight, so that takes us through May, June, July, August, September, and much of October. Of course that was a very major thing. October - The rest of October was spent floundering around, because the "Industrial Section" posts had worn such deep grooves in my brain. But then I introduced my blessed guru, Swami Masturbananda. November - I introduced the Pink Professor. Also I hit my 1000th post. December - I focused on Masturbananda and the Pink Professor. Toward the end, I essentially became the Pink Professor's boyfriend. But we're still working out the details of our relationship and don't have anything to announce yet. 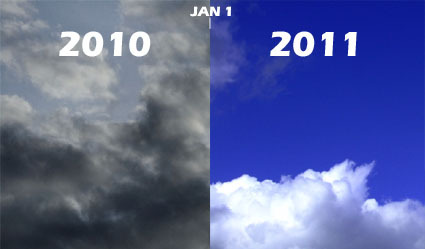 Maybe 2010 wasn't so terrible, but it's nothing compared to what 2011 will be! Only one more day of a cloudy, terrible time.